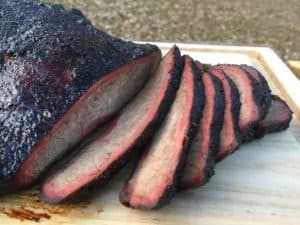 When it comes to selecting the best wood for smoking brisket you will find a bunch of different opinions on the topic. In reality, the best choice is going to come down to your METHOD of smoking brisket and the EQUIPMENT that you are using for the job. Let’s take a look at some data points and see if we can make sense out of things. Daniel Vaughn wrote a great article for Texas Monthly that broke down the brisket recipes from 22 of his favorite barbecue books. In his analysis oak and hickory were the two clear pitmaster favorites although there was some love shown for pecan, apple and mesquite. Another article published in the Dallas Observer took the pulse of the barbecue joints in Dallas and found that the pitmasters were split between oak and hickory and were rather passionate about their choice. The Winningest Man in Barbecue, Myron Mixon, uses a combination of oak and hickory for his competition winning brisket. The most famous brisket cook in Texas, Aaron Franklin, uses oak for his briskets. While there is disagreement over whether oak is better than hickory there is complete agreement on what makes these woods different. Well seasoned Oak, and Post Oak in particular, burns very cleanly with little smoke and a produces a mild smoke flavor. Hickory has a much stronger smoke flavor than oak and does not burn as clean. The difference in smoke profile between these woods is of critical importance when you are slow smoking a brisket for 8-15 hours in an offset stick burner. One of the biggest ways people screw up their barbecue is by using too much smoke and this problem really compounds itself when you are smoking a brisket for nearly half a day. If you think about the methods people use to smoke briskets then the differences in wood choices become more obvious. Aaron Franklin smokes his briskets low and slow for 8-12 hours using post oak. Aaron needs a consistent mild smoke that will not over power the meat. Myron Mixon cooks his briskets hot and fast. 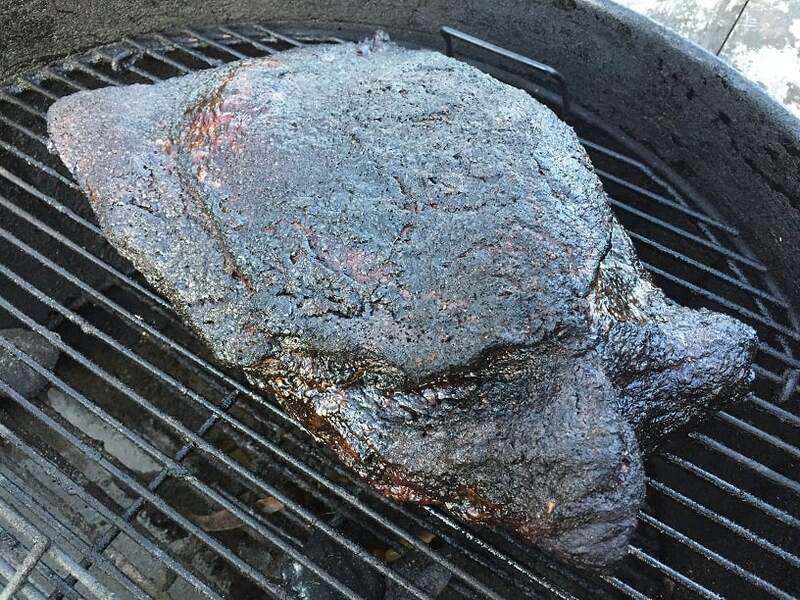 The brisket is only exposed to smoke for 2-3 hours before being wrapped in a foil pan. Since the exposure time is so short Myron needs a more powerful smoke flavor from his wood and he uses a combination of oak and hickory. So, what about you? Just because the professionals are using oak and hickory doesn’t mean that it is the best choice for you. Most backyard cooks are not cooking briskets on custom built offset stick burners. Most backyard cooks are using electric smokers like Masterbuilts. Electric smokers use wood chips and smolder them in batches producing intermittent billows of smoke. It is HARD to get a great smoke profile using this method and using a mild wood like oak will only make it harder. The same problem exists for people who are using propane smokers. 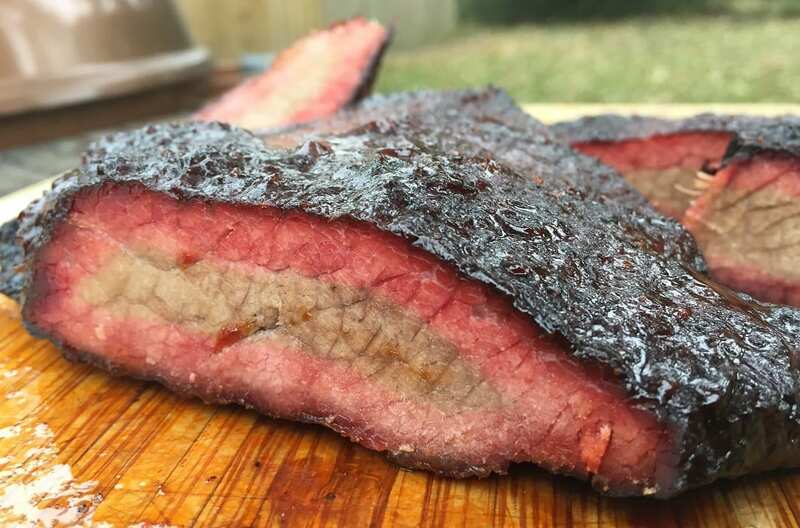 Even people using pellet smokers struggle to get a strong smoke profile and will often resort to injecting their briskets with a little liquid smoke. If you are using an electric, propane or pellet smoker then don’t be afraid to kick things up and add some hickory, pecan or even a touch of mesquite. If you are limited in how much smoke you can make then you need to make the most out of the little that you have. Another thing to remember is that people have very different preferences when it comes to smoke flavor. Melissa Cookston is a multiple barbecue World Champion and a highly successful restaurateur. She really does not care for hickory and prefers cooking over apple and cherry. For her restaurant she cooks over pecan because that is what her customers like the most. I do all of my smoking with charcoal and have switched over to using a single split of cherry when I cook briskets. I love the flavor and color that I get from cherry and by only using a single split I make sure that my briskets don’t get too smokey.